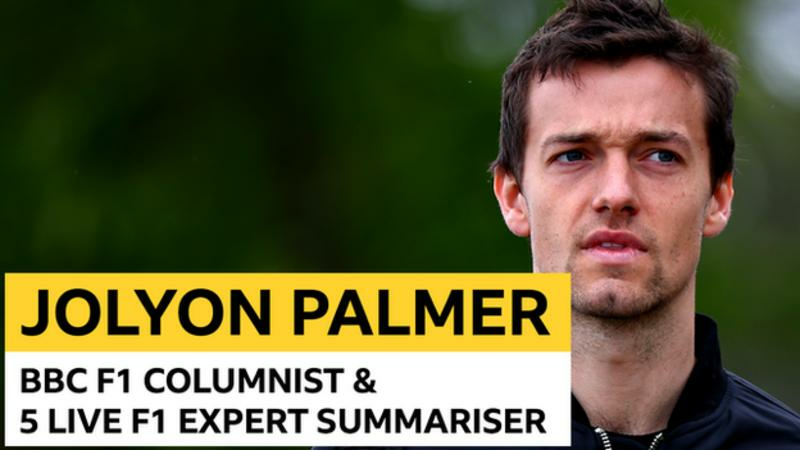 F1 driver Jolyon Palmer, who left Renault at the end of 2017, joins the BBC team this season to offer insight and analysis from the point of view of the competitors. Lewis Hamilton arrived at last weekend's Chinese Grand Prix saying he had been geeing up his team, emphasising that they needed a perfect weekend from everybody to try to eat into his points deficit to Sebastian Vettel after the Ferrari driver's win in Bahrain.By Sunday, he had done exactly that - but because of the circumstances of a crazy race, rather than anything Hamilton and Mercedes did themselves. In fact, both team and driver had another difficult race in China, and Hamilton left Shanghai admitting he needed to do a bit of soul-searching to work out what was going wrong.The weekend started so well, with Hamilton at his dominant best through Friday practice sessions.But it all changed on Saturday. The temperatures dropped and drivers were struggling with tyre temperatures.Hamilton suddenly had a woeful final practice session, having a massive spin exiting Turn 10 and many other off-track excursions. And it wasn't all that surprising when he was out-performed by his team-mate Valtteri Bottas in qualifying for the second time in succession. There is a bit of a pattern emerging regarding Hamilton and Mercedes.So often when they have the best car, or a car in good shape with the balance exactly how Hamilton wants it, he is unstoppable. That was the case in Australia at the start of the season, when he produced one of the best pole laps of recent times, to be nearly 0.7secs clear of the field.However, when things start to unravel and the car is a bit more difficult to drive, it seems Bottas becomes much more of a match for Hamilton and sometimes is ahead. It happened a few times in the first half of last year, and now again in Bahrain and China this season.Hamilton's team radio in these races reflects his general dissatisfaction.In China, he seemed to be driving while constantly thinking about the past, with regret and frustration.It began with him apologising to his team for a bad start. I don't think I've ever apologised to a team for a bad start. It's something you never hear from other drivers either. In the early laps you are busy getting your head down and fighting for position. Hamilton is nine points behind leader Sebastian Vettel in the drivers' championshipHamilton's start wasn't even that bad. Sure, he lost a place to the fast-starting Max Verstappen's Red Bull. But there are many other drivers having worse starts than that. Force India's Sergio Perez, for example, went from eighth place, his best qualifying position of the year, to well outside the top 10 on the opening lap.It was also bizarre that Hamilton was still speaking about this around lap 10 of the race.At this point, it was well in the past, but he was clearly not over it and was very frustrated about it.Maybe this comes back to the Thursday message, where he was demanding high standards from everyone in the team and he felt he had let the side down a bit.Maybe he is putting too much pressure on himself in these moments because, with 18 races to go this season, I can guarantee it won't be the last time he loses a place on the first lap. These things happen. He lost a race win in Melbourne because of a miscalculation, and that was effectively strategy gone wrong when he had dominated the weekend and fully deserved to win.His frustrations on Sunday as he realised Red Bull had pitted and he hadn't were fully justified and understandable. His team had let him down at that point. They should have pitted and were caught napping by Red Bull.A radio message from a driver to highlight his dissatisfaction with the strategy is a normal occurrence in F1 these days. A driver can't control his own strategy. They don't know what's going on in the rest of the race. They rely on the team in these instances.To miss an opportunistic gain is one thing, but to lose out to others who have been smarter hurts much more. Max Verstappen passed Hamilton with eight laps to go but the Red Bull driver did not manage to pull out enough of a lead over the Mercedes to keep the place once his penalty was appliedWe all know about the cliché of winning and losing together, but when you have been pushing flat-out for an hour or so and some guys sat on the pit wall let you down, it is mightily frustrating.Having said that, complaining once is one thing, but we heard Hamilton mention it a number of times during the final 20 laps or so.The team will have been perfectly aware of their mistake. That was clear with the way Ricciardo was making light work of the rest of F1's heavy hitting drivers out front to take an easy win.As much as Hamilton will have been annoyed about the error, for him to keep going on about it must have been annoying for the engineers.There's nothing they can do about it once it's happened. It's in the past and it felt like Hamilton was distracted by his disappointment and never really got going again afterwards. A public shaming of the strategists will only up the pressure on them as well, and might give them a few more doubts about these decisions in the future.In the end, Hamilton can count himself lucky to have closed the gap to Vettel in China. He alluded to that after the race, saying Verstappen did him a big favour by running into Vettel.What's more concerning for him is his slight blip in form. Hamilton is fully capable of pulling it together when his back is against the wall, though. Arguably he works best under pressure and he will be working extremely hard to turn it around in Baku in two weeks' time. Ricciardo was at his brilliant best in the second half of the Chinese Grand Prix. The late-race scenario of charging on fresh tyres brings the best out of him. It requires quick, convincing overtakes and that's exactly what the Australian provided on Sunday.He makes the difficult art of overtaking look so easy. The way he sets up an overtake is key. The thing is from the outside he doesn't give anything away. He knows how far back he can send a lunge in from, and when he's within range he sits in the slipstream and just waits for his opponent to brake before firing it down the inside at the last moment when it's too late for them to respond.The key for him is to give nothing away before the braking zone. When drivers move out too early, it actually becomes easier to defend as the driver ahead knows what to expect.The hardest pass Ricciardo made was on Bottas for the lead and that was because the Finn had a feeling it was coming, gave Ricciardo a big squeeze in the braking zone and it was so close to contact.It was the epic final move Ricciardo's drive deserved. His move on Hamilton was from further back, though. He did his trademark late lunge and made it look easy. No lock-up, made the apex, using the brakes to full efficiency. His judgement is remarkable.The key is to be so committed, no second thoughts or doubts about what you're going to do. When you start to second-guess yourself or change your mind during the corner, that's when collisions are more likely to happen and that's exactly what we saw with his team-mate. Verstappen wrote this message on Twitter to his Red Bull team after the collision with Ferrari's Sebastian VettelVerstappen had the race to lose after the safety car. He was ahead of Ricciardo, with the same car and same tyres and Kimi Raikkonen's Ferrari was in between him and his team-mate.The problems for Verstappen began with his first attack, on Hamilton.The attempt around the outside of Turn Seven was bold, to say the least. Verstappen had no overlap coming into the corner, the fastest one of the track, but on seeing Hamilton slow through the middle of it on more worn tyres, he tried to swoop around the outside.It would have been the move of the season had it come off, but after last week's clash between the two in Bahrain, there was no way Hamilton was going to let him go that easily.He gave Verstappen a squeeze, the Red Bull got on the slippery off-line part of the track, had a huge slide and had to bail out over the grass. That gave Ricciardo the advantage and put Verstappen on the back foot. A few laps later, having passed Hamilton, Verstappen was hunting down Vettel and made a much bigger error of judgement.He was too far back as they headed into Turn 14, but Vettel locked up and in a split second Verstappen jumped off the brakes and tried to sneak up the inside to take advantage.The problem with this move was that it wasn't decisive at all.Vettel wouldn't have seen him coming as the out-of-control Verstappen locked up and clattered into the side of the Ferrari.Verstappen realised his error and did the decent thing by apologising afterwards.As a driver on the receiving end, this does help you get over it, and Vettel was philosophical rather than angry after the race. He lost points, but at least Verstappen held his hands up and didn't get into the usual blame game we so often see.Red Bull was well-hyped this season as having potential for a championship challenge, and Ricciardo has shown they can deliver. But for his part, Verstappen needs to start bringing more consistency into his racing. Over-ambition in each of the races so far has left him only eighth in the championship, behind both McLaren's Fernando Alonso and Renault's Nico Hulkenberg, whose cars are nowhere near as quick. People love Verstappen's aggressive, entertaining driving - it's great for the sport and great viewing - but more often than not at the moment it's costing him.